Derbyshire and Glamorgan were frustrated by rain and bad light in freezing conditions at Derby with the match evenly poised. Michael Hogan claimed both Derbyshire wickets, with Ben Slater reaching 41 not out in the home side's 98-2. 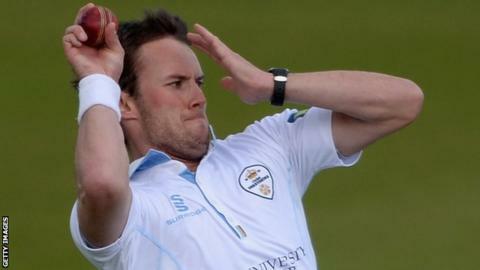 Earlier Tony Palladino claimed a five-wicket haul as Glamorgan lost three wickets in the opening 20 minutes. But Andrew Salter and Timm van der Gugten added 63 for the last wicket to take the visitors to a respectable 377. Glamorgan captain Jacques Rudolph told BBC Wales Sport: "We lost wickets up front but Andrew Salter and Timm van der Gugten put on a very nice partnership at the end which put us close to 400. "In the bowling before lunch we were a little bit off, but the way we came back after lunch was very good and all our bowlers strung it together nicely. "It's tough work standing in the slips [in the cold] but we do train in this weather. We've got to start off strongly in the morning to try to put them under pressure. "I can only assume they'll try to get as many batting points as they can and vice versa us with bowling points. You can't control the weather."